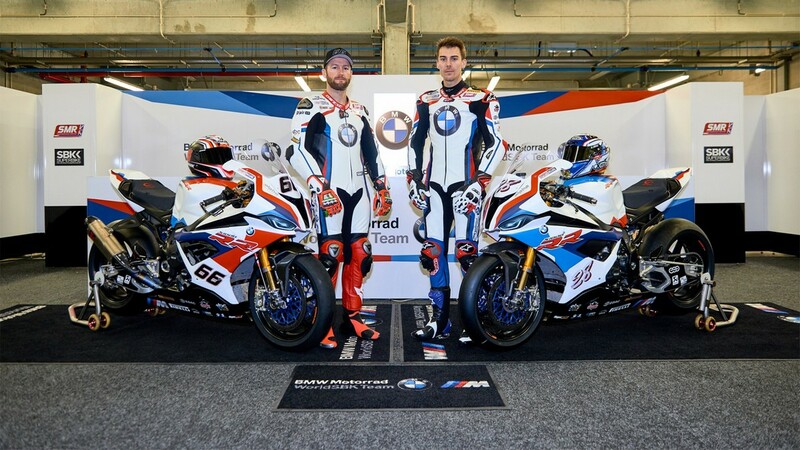 Before the final day of the pre-season testing in Portugal, BMW Motorrad WorldSBK team has unveiled the 2019 livery for their new machine. The motorcycle in the picture is obviously the 2019 BMW S 1000 RR unveiled at EICMA 2018. The covers of BMW Motorrad’s SBK machine were lifted by the riders Tom Sykes and Markus Reiterberger. The new livery religiously follows the iconic BMW M Motorsport design. The 2019 BMW S 1000 RR looks stunning taking cues from the iconic BMW-M colours, with swathes of red and blue running through the matte white finish machine. The 2019 BMW S 1000 RR is an improvement on a lot of fronts. The power produced by the inline-4 is now 207 Bhp at 13,500 rpm and the peak torque is 113 Nm at 11,000 rpm. It also gets the BMW ShiftCam technology, which brings variable valve timing and valve stroke to the intake side of the valve train. BMW also says that it has revised the geometry of the intake and exhaust ports for optimization. It hasn’t only gained power but has lost weight too. The new bike weighs 197 Kg fueled and road ready. The chassis sees a lot of improvement too. The engine is now more of a load-bearing member of the chassis which helped them make the chassis lighter. BMW is also showing off what it calls “Full Floater Pro kinematics” in the rear wheel suspension, which brings increased feel and traction to the rear of the motorcycle. But of course the WorldSBK machine is lighter and even more powerful with the race fairings and modifications. Even though we do not have any numbers, we are quite sure that they’d be convincing. WSBK ready to lay rubber in India in 2013. All times are GMT +6.5. The time now is 09:13 AM.